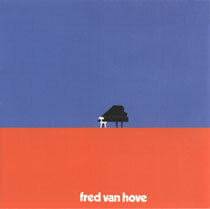 Fred Van Hove, piano, Hammond organ (CD 2, track2); Cel Overberghe, tenor saxophone, bass/drums. Tracks CD 1, 1-6 recorded in Brussels on 17 February 1972 and originally released on Vogel 001-S in 1972; tracks CD 1, 7-9 and CD 2, 1-3 recorded at Schelle, near Antwerp on 30 November 1972 and originally released on Vogel 002-S in 1972; tracks CD 2, 4 and 5 recorded in Brussels on 28 December 1973 and originally released as a 7-inch single on mu records in 1973 (MU 1); remaining tracks were recorded live at the u.i.a (Universitaire Instellingen Antwerpen) on 18 November 1974 and originally released on Vogel 004-S in 1974. Cover design (reproduced above) by Paul Ielegems (same as Vogel 001-S).